Download The Space Between Us in Digital HD from the iTunes store. 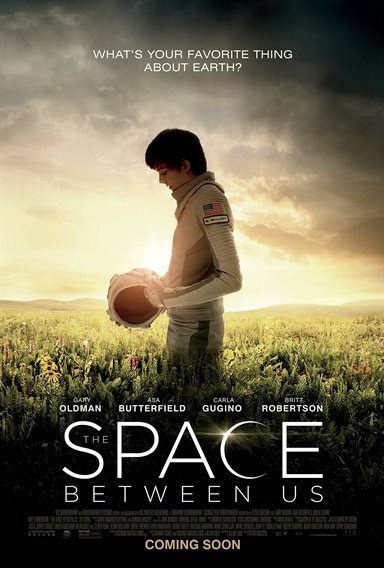 The Space Between Us images are © STX Entertainment. All Rights Reserved. Why has travel to Mars become such a hot movie topic of late? Last year's The Martian was a cautionary tale of space exploration and the triumph of the human spirit. Other than the clichéd ending, it was a gripping and moving commentary on life and outer space. This month's The Space Between Us also tries to stir audiences' emotions with a story set partially on Mars but, unfortunately, it doesn't pack the same punch as the former film. Sarah Elliot (Janet Montgomery; Salem) heads a team of astronauts on a mission to settle Mars. However, on her way, it is discovered she is pregnant and due to give birth shortly upon arriving on the barren planet. Sadly, she dies shortly after the baby is born and Gardner (Asa Butterfield; Ender's Game) goes up in space with a group of scientists as "surrogate" parents. Now 16 years old, Gardner longs to find his father on earth and meet the teenage girl, Tulsa (Britt Robertson; Tomorrowland), he has been conversing with online. Unfortunately, having been gestated and born in zero gravity, Gardner's body wouldn't survive the trip to earth until they figure out how to make his bones less brittle through surgical means. Finally, he goes to earth, meets Tulsa, and finds his father (though not in the way he imagined). Then, because Earth is killing him, Gardner has to go back to live the rest of his life on Mars. Robertson, is one of the latest "who to watch in Hollywood" actors, and she is just as appealing as she is in anything else she has done lately. She plays a tough, no-nonsense orphan with a similar attitude we watched in Tomorrowland. Butterfield is shockingly (sarcasm) a nerdy, awkward, computer geek teenager - a role we have also seen from him before. Gary Oldman is delightful to watch as always and Carla Gugino (Wayward Pines) does an admirable job as one of the scientists who raised Gardner. The plot is rather far-fetched and, while one has to suspend a level of disbelief for any outer space film, this one goes a little too far. The plot twist at the end can be guessed at almost from the beginning so the big "reveal" isn't all that much of a surprise. The underlying themes are ones we have seen time and again just told in a unique setting. Unfortunately, some of the dialogue and "hokiness" makes you want to groan on occasion. Director Peter Chelsom (Serendipity) has some great shots of the United States and manages to make a believable view of Mars but I feel like he left holes in some of the plot. What does Sarah die from? How did none of the scientists sent to Mars ever leak the story of the boy who was born there? Other than a few minor things, Gardner seems oddly well equipped to new experiences on Earth even though he shouldn't be. The ending also seemed a little rushed and unfulfilling. If you are a hormonal, romantic, teenage girl with a crush on Butterfield, you will want to buy a ticket to this film. Anyone else isn't going to enjoy it nearly as much. The general themes of a "coming of age" tale, "finding one's place", etc. is lost on a more mature crowd. It's cheesy, cute and somewhat heartwarming but certainly not a magnificent piece of cinema to be praised for the next few years. OMG! Can't wait to watch.